POLICE visited the home of a Hampstead pensioner four times before they found his body, the Old Bailey heard this week. Wang Yam, 46, of Denning Road, Hampstead, is on trial, accused of murdering reclusive 86-year-old Allan Chappelow in the early summer of 2006. Mark Ellison QC, prosecuting, told the court on Monday that after a series of mysteriously large internet transactions were attempted from a number of Mr Chappelow’s accounts, police were tipped off by HSBC branch in Finchley Road, where Mr Chappelow had an account. The bank wrote to the pensioner – a former photographer and author of two books on playwright George Bernard Shaw – to discuss the transactions but he never replied. 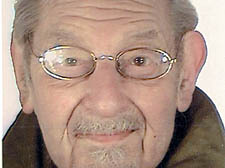 Mr Chappelow’s body was badly decomposed when detectives finally found it at his Downshire Hill home in mid-June 2006. Police believe he may have been dead for at least a month. Officers kicked in the locked front door, but found themselves faced with another locked door. It would not budge, so officers used a metal battering ram to smash their way in. Inside, a scene of squalor and dilapidation awaited them. “There were flies in the hallway and an unpleasant smell,” Mr Ellison told the jury. “It looked like the owner had not been there for some time. Officers searched the house from top to bottom, but because of the state of the house, with rooms full of rubbish and the stairs rotten, they felt it was not practical to search any further. It was only during the fourth visit to the house that they uncovered the rotting corpse of the home’s owner. The jury heard the victim was buried under papers in a downstairs room, lying face down. Defence QC Geoffrey Robertson said there was “more blood than Sweeney Todd” splattered on floors and walls, with the victim bludgeoned over the head “like a seal pup on an ice floe”. The court heard that Mr Chappelow had had hot wax poured over him before he was killed. He had suffered numerous broken bones, his skull had been fractured and his throat battered with a lump of metal or wood. During the opening two days of the trial – due to last until Easter – Mr Ellison described Mr Yam as a man in “deep financial difficulties”, with debts of £1.1 million. He was due to be evicted from his flat, the court was told, but over the past year had given a series of estate agents in Hampstead the impression that he had funds to buy a large home in the area. He had put in four bids for properties worth well over £1 million in nearby Gayton Road. Mr Yam denies murder and charges of burglary, theft, handling stolen goods and obtaining a money transfer by deception. The court was told that Mr Yam’s financial predicament gave him a motive. “The evidence shows that when Wang Yam started to steal the victim’s post he was in real problems,” said Mr Ellison. He added that, while Mr Yam tried to “manipulate Mr Chappelow’s funds and credit,” he did so “with remarkable confidence”. This was because Mr Yam knew there was no danger of him being disturbed by Mr Chappelow as he returned to his home to steal his post – because he knew the pensioner was dead, Mr Ellison told the court. The prosecution claimed that mobile phone records placed Mr Yam in Kentish Town, Camden Town and Charing Cross Road as Mr Chappelow’s bank accounts were being accessed via internet cafés in those areas. Mr Robertson opened the defence by saying Mr Yam’s grandfather was a comrade of Chinese Communist leader Chairman Mao and joined him on the historic Long March after the Communists were routed by Chiang Kai-shek’s Nationalists in the 1930s. He rose to the rank of major general in the Chinese Army. But for his grandson, the jury was told, the Communist dream had soured and he became involved in the late 1980s with the country’s burgeoning democracy movement. Mr Robertson said Mr Yam was an academic, “something of a computer expert,” who repaired his friends’ computers. He studied electrical engineering at Beijing College of Technology, where he became involved in the democracy movement – the student protesters involved in the Tiananmen Square massacre, the court heard. Mr Yam fled to Hong Kong, where he sought asylum, the QC added. He moved to London in 1992, and became a British citizen in 1998. Mr Robertson told the jury that circumstantial evidence linking the defendant with bank fraud did not make him the killer. “The prosecution cannot show that Mr Yam was ever inside Number 9 Downshire Hill, or had anything to do with the murder scene,” he said. “Denning Road [Mr Yam’s flat] was turned over by a police forensics team and they found nothing to link him – no scientific evidence at all. The forensic evidence screams out that he was not involved. The QC then claimed that “men with no allegiance to this country” were behind the “horrific and sadistic killing”. He added that Mr Yam had made no attempt to cover his identity when going into shops and banks with Mr Chappelow’s bank details. The court went into a private session on Tuesday afternoon. Before the trial was closed to the public, Mr Robertson said that his client had a full explanation to give to the jury. “But you will have to wait till our secret sessions to hear it,” he added. WHEN Allan Chappelow returned from a month-long trip to visit a cousin in the United States in March 2006, he discovered someone had broken into his rundown home in Downshire Hill, Hampstead, and stolen his post. The court heard that before he had left the country, he had asked his next-door neighbour to check his letterbox each day. Mr Chappelow, as well as owning his home – since sold for £4.1 million – had a number of bank accounts. One savings account held £52,000, while a Sainsbury’s account had about £4,000. THE prosecution’s case has centred on alleged attempts to cash cheques relating to dividends from more than 92,000 shares Allan Chappelow held in entertainment group Rank Organisation and a money transfer of £20,000 from one of the reclusive pensioner’s accounts. But the Old Bailey has also heard how Wang Yam allegedly tried to use Mr Chappelow’s Visa card to pay for a meal on a date with a woman at a curry house in South End Green, Hampstead. The jury was told Mr Yam and a woman friend dined at Curry Paradise, in South End Road – a five-minute walk from Mr Chappelow’s home – and tried to settle a bill of £33 using a Sainsbury’s Visa card in Mr Chappelow’s name. It failed, and the restaurant manager eventually allowed Mr Yam to pay £17 and leave his mobile phone as a deposit while he went to fetch the balance in cash. “The person in the restaurant was clearly the defendant,” concluded Mark Ellison QC, prosecuting. Other evidence offered by the prosecution included CCTV footage of Mr Yam at Foyles bookshop in Charing Cross Road, where he spent £74 on two computer books – using Mr Chappelow’s credit card, it is claimed.